XBMC playback iTunes Media Solution - How to View iTunes Movie via XBMC? View iTunes purchased or rental M4V movies via XBMC for airplay. How to View iTunes Movies via XBMC? Sharing media contents among Apple devices has never been a difficulty for us. However, if you don't have enough Apple devices, the Apple's Airplay will be helpless to you. So, we would like to create a home theater system to enable media sharing among all of our digital devices. 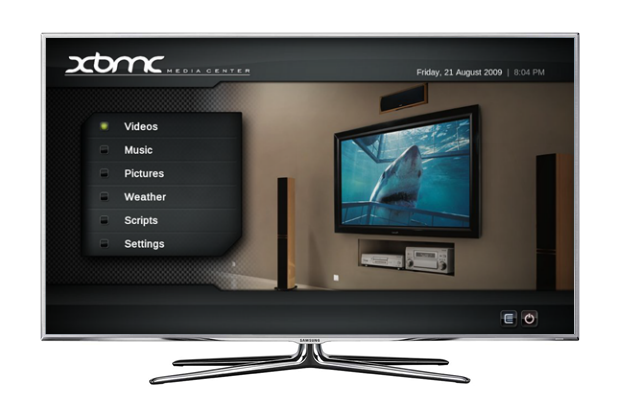 XBMC has been the most popular media player that can be used to build a home theater system. And there will be a trouble that maybe you are not able to play the movies downloaded from iTunes Store via XBMC. Apple protects the media contents from iTunes Store with DRM which makes it impossible to view iTunes movies via XBMC. So, the best way to get XBMC play iTunes movie is to remove DRM from those M4V movies. NoteBurner M4V Converter Plus (For Mac & For Windows) is just a powerful DRM removal tool which can help you easily get rid of Apple's DRM protection from those iTunes M4V movies. Besides, it is also a useful iTunes M4V video converter that can convert iTunes M4V to various video formats like MP4, MOV, AVI, MPEG-4 and so on. Guide: How to convert iTunes M4V movie to XBMC? NoteBurner iTunes M4V to XBMC converter not only supports iTunes purchased movies, but also supports convert TV Shows and music videos purchased from iTunes Store. You can freely click the add button to import the M4V video resources to the program. The XBMC media center supports almost all kinds of video formats for playback, so you have many choices to decide which output format you want on NoteBurner DRM M4V to XBMC converter. Click the profile button and then you will find get the profile menu. Here we recommend you try Same as source video MP4 (*.mp4). 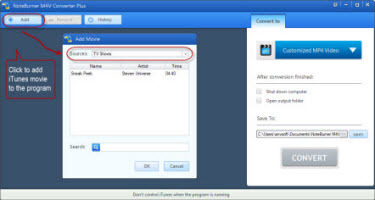 Finally, you need click the convert button to start conversion from iTunes M4V to XBMC MP4 video. After the conversion completed, freely click the location button to find the converted movies. After that, you can directly play the movie on your PC or you can stream the movie to your HDTV for playback via XBMC home theater system.